What do you get when you combine sleek style with a superfood? 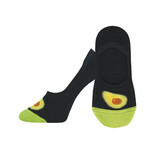 Avocatoes, of course! Give your sock game a bounty of fashion nutrients with these avocado socks. No show socks let your shoes be the stars of the show, but you’ll still know you’re packing quality, comfort and fun underneath.